The kennel LUX LORAL is owned by us – 2 sisters – Kristine & Inguna. We live in Riga, Latvia. We are Latvians! The main breed in our kennel is Italian Greyhound since 1996. Our second breed is Blue Roan English Cocker Spaniel since 2005. The kennel LUX LORAL was registered in the FCI in 2002. Kennel LUX LORAL was created by our mother – Rudite Krukle who suddenly passed away in 2003. We continue her good work on Italian Greyhounds with double power in tribute to our mother! We always had dogs and cats in our home from childhood. Our parents taught us to love them as they were real animal loving people themselves. Thanks to our parents, especially our mother! Our family`s first show dog was German Shepard – JAGO, he had an excellent show career. Also he was a great dog, loyal companion and Top class working dog. JAGO lived from 1972 to 1984. Later we had a few Toy Terriers - RIKA & her son ROJS. 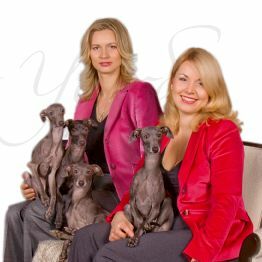 In 1996 our mother purchased our first Italian Greyhound – LORAL DOLČE in International Dog Show in Riga, Latvia. She was an Isabella female from Jelena Krūze in Valmiera, Latvia. Dolče started our interest about the breed and our serious work on breeding. In these 20 years we have had 16 litters. We don’t make litters very often. Each of our litters is well thought out. We go for quality and not for quantity. For us the most important characteristics are health, movement and closeness to the standard. We love IGs because they are elegant, attentive, petite and full of electric life spirit. They are dynamic dogs with astonishing grace of movement and lightning speed when running free in our garden or in the forest. Why do we have Blue Roan English Cocker Spaniels? Inguna’s husband always had English Cocker Spaniels in his family. His grandfather had a very famous black cocker – SWEEP who was a solid gold medal winner at the famous Royal Agricultural Show in England in 1912. He personally had English Springer Spaniel BEN and blue roan English Cocker Spaniel WILLIS, they both passed away in 2003. In 2005 he purchased our first pedigree English Cocker Spaniel ULTRA BLUE LUCKY STRIPE from Solveiga Plāts in Ventspils, Latvia. Thanks to Solveiga for our beautiful girl and support! In 2008 we had our first English Cocker Spaniel litter. We are very careful with new owners for our bred puppies – we don’t sell to re-sellers and cage-kept kennels. We are breeding good show dogs who will become beloved family members! Only two IG has not been our own breeding: first - LORAL DOLCE and secound - ALIBABA who was purchased in Italy, his breeder is Giulio Guizzi. Thank you Giulio for letting us have this beautiful dog! We love to participate in Dog Shows all around Europe. Normally we do approx. 40-45 shows a year. We love to travel and meet our dog friends! Our Italian Greyhounds are all breed National & International Dog Show BEST IN SHOW WINNERS! Our Italian Greyhounds are: World Winners, World Junior Winner, World Vice Winner, Word Veteran Winner, World Vice Veteran Winners, European Winners, European Vice Winners, European Junior Winners, European Veteran Vice Winners, Euro Sighthound Winners, Euro Sighthound Junior Winner. Our bred dogs are the following champions: International Beauty, Austrian, Latvian, Estonian, Lithuanian, Baltic States, Swedish, Finnish, Norwegian, Nordic, Luxemburg, Swiss, Russian, RKF, Belarussian, Ukrainian, Ukrainian Grand, Slovakian, Slovak Grand, Slovenian, Czech Republic, Czech Grand, Polish, Bulgarian, Hungarian, Hungarian Grand, Romanian, Balkan, Latvian Junior, Estonian Junior, Lithuanian Junior, Baltic States Junior, Austrian Junior, Hungary Junior, Slovak Junior, Russian Junior, Polish Junior, Romanian Junior, Slovak Vetran, Latvian Veteran, Estonian Veteran, Lithuanian Veteran and Baltic States Veteran. We are members of Ventspils Dzivnieku Audzetaju Biedriba (LV) and Slovak Sighthound Club (SK). Dear visitors, please notice, it is not allowed to make any copies in our website without our written permission! Thank you! Information in our website is according to the Latvian Constitution (SATVERSME) VIII.99.p. and 100.p..